The answer key for GATE exams is the most sought after and enquired about by GATE aspirants once the exams are over. Taking this into consideration, the organising body of GATE 2017 exam, IIT Roorkee will be announcing the provisional answer key for GATE 2017 within a few days once the GATE 2017 exams are over. If you are aspiring to crack GATE 2017 and appearing for the exams that are to be held on four different dates i.e. 4-5 Feb 2017 and 11-12 Feb 2017 for different branches you have landed at the right place. The Answer Key for each date will be different from the others. The GATE answer key will be quite helpful to you in calculating your approximate score in the GATE 2017 examination. The answer key will also help you in knowing whether you will be able to satisfy the GATE 2017 cut off marks or not. If you have applied for any PSU then also you can use the GATE 2017 answer key to know about the cut off for PSU recruitments. Initially the answer key announced by IIT Roorkee will just list the correct answers to questions asked in GATE 2017 exam. The final answer key will be released later. 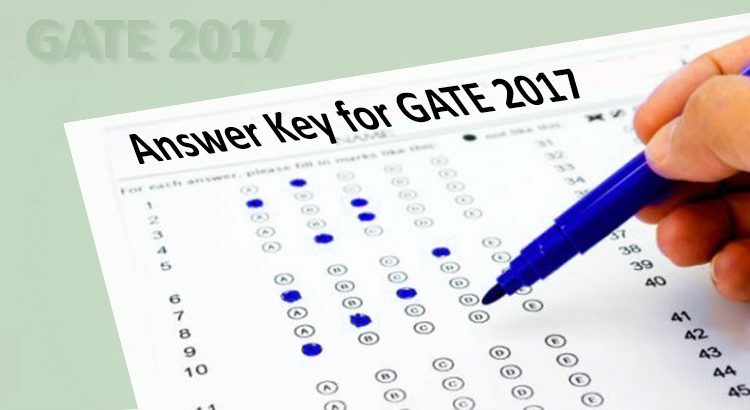 To download the official GATE 2017 Answer Key, you will have to check the session you have appeared for, and then click on the given link next to the GATE Paper and session. A PDF file will open in a new browser from where you can use either the ‘Download’ or ‘Save’ button to download and save the answer key file. IES Master will also be releasing the GATE 2017 Answer Key which contains the most accurate solution for each question. You can download the Answer Key for GATE 2017 along with solutions prepared by IES Master for each branch from HERE.